The imminent arrival of the dreaded "patent cliff" has been haunting the pharmaceutical industry for years, and it's finally here. With patents on many blockbuster drugs about to expire, an estimated $250 billion in sales are at risk between now and 2015, according to data from EvaluatePharma. Once drugs lose patent protection, lower-price generics quickly siphon off as much as 90% of their sales. For consumers, the savings from generics can be substantial, as this price table of the top 25 brand-name drugs with available generic counterparts highlights. According to pharmaceutical analyst Sophia Snyder at research firm IBISWorld, generics now average about 30% of the price of the brand-name originals. 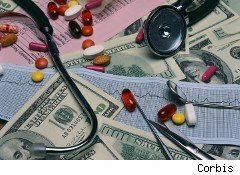 In 2010, the pharmaceutical industry had sales of $860 billion worldwide, up 3% from 2009. Just 133 blockbuster drugs accounted for $295 billion of those sales -- about 34% of the market -- according to IBISWorld. Of those blockbusters, 13 are set to lose patent protection through 2013. Although the generic industry will benefit in the short term, it will also see a slowdown in revenue growth after 2015 because fewer blockbusters will be coming off patent for them to replicate, IBISWorld said in a recent report. In 2008, Pfizer reached an agreement with Indian generics manufacturer Ranbaxy Laboratories. Ranbaxy will have a license to sell atorvastatin in the U.S. effective Nov. 30, 2011, and have exclusivity for 180 days before other drugmakers can enter the market. 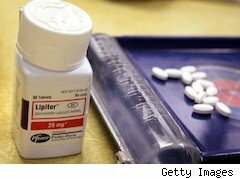 Watson Pharmaceuticals will also introduce a generic for Lipitor. Between 2010 and 2012, drugs that make up 42% of Pfizer's pharmaceutical revenue will lose patent protection, among them the antacid Protonix. Generic drugmakers Teva and Sun Pharma actually launched a generic version of Protonix in 2007, but in 2010, a judge upheld the patent till 2011. The legal battles regarding any damages the two may have to pay are ongoing. The loss of exclusivity on so many drugs -- among them antipsychotic Geodon, with $890 million in U.S. sales in 2010; erectile dysfunction drug Viagra with $1.015 billion; overactive bladder drug Detrol/LA with $693 million; and eye pressure lowering medicine Xalatan with $616 million to name some -- will deeply impact Pfizer. After bringing the world the iconic anti-depressant Prozac, Eli Lilly (LLY) introduced the antipsychotic Zyprexa in 1996. In the U.S., Zyprexa (olanzapine) is approved by the FDA for the treatment of schizophrenia and bipolar disorder. In 2010, Zyprexa's worldwide revenues were just over $5 billion, or nearly 22% of Lilly's full year sales. Since 2003, Zyprexa consistently had revenues of over $4 billion. But Zyprexa has generated controversy as well as revenues. 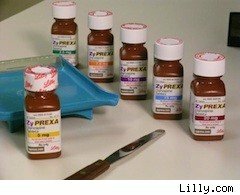 In 2009, Lilly agreed to pay $1.415 billion to settle criminal and civil allegations for the off-label promotion of Zyprexa to treat dementia. Also in 2005 and 2007, Lilly settled lawsuits with patients over claims that Lilly withheld information about the drug's link to high blood sugar level and diabetes. Price tags: $700 million and $500 million, respectively. Zyprexa's patent is set to expire in October, and according to Snyder, Lilly is one of the worst positioned companies to compete after the patent cliff. Johnson & Johnson (JNJ) saw patents expire for antipsychotic Rispersdal in 2008 and seizure med Topamax in 2009, and now it's set to lose patent protection on heavy-duty antibiotic Levaquin and ADHD treatment Concerta, a sustained-release version of Ritalin. J&J is more diversified than most pharmas, with large consumer products and medical devices segments. Nonetheless, in 2010, Levaquin (levofloxacin) and Concerta (methylphenidate) had sales of $1.4 billion and $1.3 billion worldwide, comprising together 12% of the $22.4 billion in pharmaceutical revenues and 4% of the company's total $61.6 billion in revenues. This anti-clot or blood thinner most prescribed to prevent heart attack or stroke claims the title of second-best selling drug in the world, with $9.4 billion in global sales in 2010. 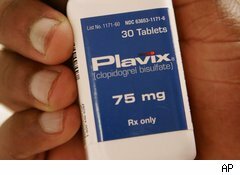 Plavix (clopidogrel) was discovered by French pharmaceutical Sanofi-Aventis (SNY) and was co-developed with Bristol-Myers Squibb (BMY). The drug is marketed jointly by both. In 2010, Bristol recorded $6.7 billion in Plavix sales, or 34% of its total revenues of $19.5 billion. Sanofi recorded sales of over 2 billion euros (roughly $2.7 billion), or 7% of its 2010 revenues of 30 billion euros. 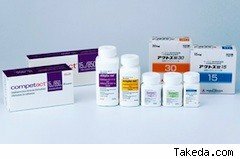 In 2006, generic drugmaker Apotex briefly marketed generic Plavix, but was ordered to stop until November 2011. The order was extended recently by the FDA, but Plavix's patent is set to expire on May 17, 2012. Bristol-Myers Squibb is facing 2012 patent expirations for two of its three top sellers, Plavix and high blood pressure med Avapro, with global sales in 2010 of $1.2 billion, and its deal to market Abilify is also due to expire in 2012 ($2.6 billion in worldwide 2010 sales). Sanofi already lost patent protection in the U.S. on its top seller, Lovenox (enoxaparin), a blood thinner. In 2010, the company said generic competition caused loss of more than 2 billion euros in sales. Sandoz, the generic pharmaceutical division of Novartis (NVS), is already marketing generic enoxaparin. British pharmaceutical AstraZeneca's (AZN) antipsychotic Seroquel was introduced in 1997, and has been approved for a variety of conditions from depression to bipolar disorder to schizophrenia. Worldwide sales amounted to $5.3 billion in 2010, or nearly 16% of Astra's revenues. 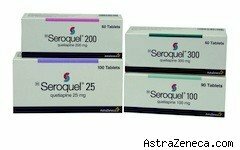 Seroquel was originally going to expire in September 2011 but received a six-month extension from the FDA through a pediatric exclusivity. Astra'a situation could hardly be worse: Medicines that generated 62% of it's 2009 revenue will face competition from lower-priced copies by 2014, Snyder said. Further, the company's pipeline doesn't appear strong enough to offset the impending generic onslaught. Hopes that Brillinta could develop into a major blockbuster are on hold as the FDA has been delaying its decision about the drug. Merck's (MRK) oral asthma and allergy treatment Singulair was first cleared by the FDA in 1998. Its growth has been consistent despite the FDA adding warnings to its label about side effects including depression and increased suicidal thoughts. In 2010, worldwide sales for Singulair were $5 billion, a 7% increase, and nearly 11% of Merck's total revenue. Merck is already reeling from the loss of exclusivity for its blood pressure drugs Cozaar/Hyzaar. The two have seen sales slump by 41% in 2010 to $2.1 billion. Still, Snyder says "Merck is potentially the best positioned among large pharma companies as the patent cliff nears." Merck has already overcome lost revenue from several major products due to patent expiry or product withdrawal, including Vioxx (withdrawn in 2004), Proscar (2005), Zocor (2006), Fosamax (2008) and Cozaar (2010). "The company's diverse late stage pipeline and promising earlier stage candidates should offset Singulair patent expiry and support near and longer term growth," Snyder says. The patent on the type 2 diabetes medication from Japan's Takeda, which was launched in 1999, already expired in January. But Takeda came to an agreement with generic drugmakers Ranbaxy, Watson and Mylan under which they won't start marketing Actos until August 2012. Sandoz, Teva Pharmaceutical Industries (TEVA) and a few others will enter the market 180 days later. Over the first nine months ending in December of its fiscal 2010, Actos recorded sales of 293 billion yen ($3.58 billion), or 27% of its total revenue. Sales were also affected by a sharp decrease in Prevacid sales due to the loss of exclusivity in the U.S. Unlike the other top drugs losing patent protection, Amgen's (AMGN) arthritis and psoriasis treatment Enbrel is a large-molecule biologic. As such, it will be much harder to duplicate. Even with the FDA trying to put in place procedures to ease the entry of generic biologics, or biosimilars, into the market, the process is just beginning. Hence the attraction of biotech to Big Pharma: It's the reason Roche bought Genentech, and Sanofi-Aventis acquired Genzyme (GENZ). With Enbrel's total sales in 2010 coming to $3.5 billion -- 23% of Amgen's total revenue -- it, too, would have felt the vulnerability of the patent cliff. And Pfizer would take yet another hit, as it markets Enbrel outside the U.S., Canada and Japan. Pfizer's 2010 sales of Enbrel were $3.2 billion. "Both [the generic and brand-name pharmaceutical] industries are increasing their emphasis on biologic drugs, which are harder to replicate, but were recently given a 12 year limit on patent protection via the Patient Protection and Affordable Care Act," explained Snyder. "The brand name industry sees a lot of potential revenue here, and the generic industry is already increasing their R&D investment to find ways to create biosimilars."